In case you haven't noticed yet, the test server interface has been heavily improved upon to make player interaction easier. Want to know what exactly has changed? Feel free to share your feedback below and let us know if you'd like to see such changes on your live instance as well! I gave this feed back a long time ago. Seems like you guys ignored it or just didn't read it. Please do NOT add the max default for any production. •Automatically input the maximum affordable amount of recruits in the Barracks by default, and set the window focus to the input for the number of entries. The problem with idea is that if you accidently click okay on anything "max" and your production is currently empty. You basically screwed yourself over with a LONG production with no cancelling option. You must pay gems to clear it or wait the super long production time. Please do NOT allow for max default. It's bad enough that you have max default setting for resource deposit refills on fish and meat. Where I have to constantly slide it down to 0 and inputting the number manually. Have a separate Button for "max". So that it jumps to the max when you click on it. BUT do not have max by default. As a person who plays this game and understanding the production mechanics. I almost ALWAYS avoid the slider bar 1 to 25. I leave it on "1". And then use the second slider bar to say 25 or whatever magic number. Because the "queue" only takes up 1 to make which allows me to cancel the entire thing with the clear queue option button. When you clear everything, it never clears the one that is currently in production. So if the current production is sucking up 25 (that means it will take a VERY LONG time to spit out). Especially bad when you accidently clicked on it. And especially bad when you need to switch to producing something else fast for a quest or daily. You want don't ever want to be stuck doing any long production when you can avoid it. By producing single units you're only tying up the queue with short builds- making it easy to switch orders fast. And whatever you're producing can be used immediately. Example. Doing a production of a basket 25. You have to wait for the entire thing to finish to just even use 1 buff. It won't give you any of the buffs you've made already. By doing a basket production of "1" but having 25 entries, this means as each one is being produced, you can immediately start using those buffs as they're finished. And if you need to say do an emergency clearing of the 25. You can do it, and have to wait for only 1 item to finish. rather than the entire 25. Or You could move some order up the chain fast. Last edited by RonnieEmpire; 06.07.18 at 23:15. I would hate to be the guy who selected "25" on the Stadium Snack. and forced to wait 73 days to use 25 of those buffs. Thank god I single selected 1 snack and dragged the second bar to 25 instead. So I can get my snacks as soon as they're made every 3 days. - I like the production input fields with the right side being focused by default. It's also nice that the military units have max stack size selected by default while other productions have it on one. Can't really put a stack of manuscripts or tomes on a +week queue by mistake. - Generals that have been retrenched or are in star menu due lack of space should have their own symbol to indicate that. A lot of adventures, especially MCC does not have enough space so a lot of the generals stay in the menu and you have to click them to find which ones are in star and which ones were lucky to land. Send order does not matter if they have different walk times to storage in home island, different skills, or the island is not activated before you enter it. - When you apply resources from star to mayors or a deposit the input field is too small. Anything above +200k or one million gets visually cut out. The field should not be maxed out by default. I rarely want to apply everything to mayors or to a deposit. Please add a MAX button instead as the dialog has space or can be resized. - Remove private and guild messages from mailbox select/delete all process or add a warning when user has multiple items selected and they include these type messages. A lot of people delete these by accident when they remove battle reports and buff notifications and message was sent in between. - Hopefully specialists are getting some mass use option as now it takes several hundreds click per day just to send them while it could work similarly to the send generals window. Last edited by Mannerheim; 07.07.18 at 15:42. New large STAR menu is excellent. Could you do the same with SEND ARMY windows? I would like to see general´s name (my own edited name like XP general), not the UNIVERSAL name like Veteran. Preview on general / explorer (pointing the mouse on them) I know they are skilled, but I have no idea which LVL of the skill they have. Is it possible to show the level of the skill? Is it possible to read the skill tree of the moving general/explorer? 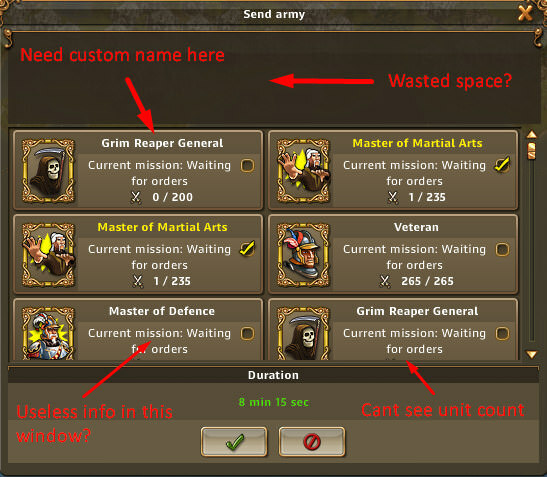 SEND ARMY window - could I select all tavern generals, all veterans and so on? You have tons of empty place on the top. SEND ARMY window - instead of useless text could I see units loaded? Same for generals. Skilled generals (same type - MMA) are mixed with unskilled generals. Could you add something like in barracks? Buying 100 pcs of Seeds is very annoying. Could you resize the window to see more items and prologue/rearrange left menu? Last edited by LosAngel; 07.07.18 at 20:08. Send Army window: Generals with assigned troops at top, Generals with no troops at bottom would be nice. 1 The size of the Trade Office/Sell and Star Menu windows have been increased to show more items and improve usability. 2 All timed production windows (e.g. Barracks, Provision House...) now allow text input when choosing amounts. 3 Automatically input the maximum affordable amount of recruits in the Barracks by default, and set the window focus to the input for the number of entries. 4 "Select/Deselect all filters" has been added to both the Trade Office and Sell Window to improve usability. 5 Buff amounts are updated instantly when applying buffs multiple times in quick succession. 6 It now shouldn't be possible to input "0" as a quantity of any production or buff input. 7 The "Apply Buff" panel should now hide automatically when there is no more buff quantity left. 8 The Combat Preview persistent after applying to a camp so players can see the previews on multiple camps without having to select troops again. 9 Fix scrolling behaviour across all UI windows to be more accurate and consistent. 10 You can now use the "ENTER" key to confirm trades and buffs. 11 You can now use the "ESC" key to exit UI windows and navigate back within sub-panels. 12 Remember the last buff amount if the same buff window is opened to cover the common case where a player wants to split resources evenly between deposits. 13 The window should now focus on the text input when opening the trade window and apply buff panel. 1 - Almost good. Confusing if you are selling and need to find a certain item via a search (= increased no. of results). 10 - Good. Works with barracks as well, btw. The Combat Preview needs an "Attack" button. Lol, I do not like this part of the game.